Olney, located in the north-central portion of Montgomery County, was originally known as Mechanicsville up until about 1800 when its current name was established. As an unincorporated area, Olney’s boundaries are not officially defined. 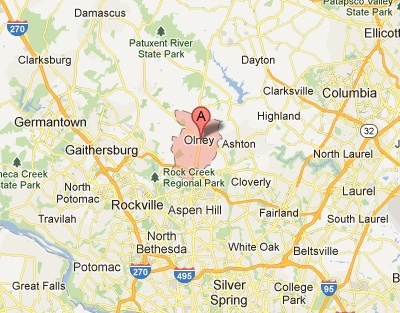 The United States Census Bureau defines a Census-Designated Place of Olney centered at 39°9′ North and 77°5′ west. It has a total area of 13.0 square miles (34 km2). None of the area is covered with water. Olney’s town center sits at the intersection of state route 97 (Georgia Ave.) and route 108 (Olney-Laytonsville Road). The town, larger than any other in the neighboring areas, lies south of Brookeville, west of Sandy Spring and east of Rockville and north of Aspen Hill. Playgrounds, playing fields and courts are available throughout Olney and the surrounding area. Many of the parks are public and some belong to homeowners or other private associations. Public parks include Olney Manor Park (featuring the Olney Swim Center, a year-round indoor public pool), Southeast Olney Park, Longwood Park, Cherrywood Park, Bowie Mill Park, and the OBGC Park at Freeman Fields. Olney is also home to a private country club and a golf driving range. Olney has various public and private schools, including three private elementary schools. Brooke Grove Elementary School, a public elementary school in Olney, was awarded the prestigious Blue Ribbon School for Excellence. There are three Montgomery County Public School clusters that bisect Olney, with some children attending elementary and middle schools that send students on to Magruder High School and others attending schools that send students to Sherwood High School or James Hubert Blake High School. The new Our Lady Of Good Counsel High School building opened in January 2007, enabling the Roman Catholic high school to relocate to Olney from Wheaton, Maryland. The new building of Washington Christian Academy recently opened in Olney, completing its long term goal to relocate to the blossoming suburb. Although largely a residential area, Olney maintains ties to its cultural past. The stately Olney Inn was destroyed by fire in March, 1978, but the historic Olney Ale House continues to operate on the east edge of town. Farther east lies the Sandy Spring Museum and Woodlawn Manor Living History Museum where visitors may learn more about the area or visit historic Woodlawn Manor c 1800 for Tea & Tour.